Accumulation Planning - Wealth Legacy Group®, Inc.
We make sure that your retirement planning is properly designed so that you can really enjoy your retirement years. We help you to maximize your retirement income and assets by focusing on specific deadlines and amounts that you intend to have earned or saved. We review your retirement investments and investment portfolio and help you to eliminate underperforming assets. Over $1.3 trillion in outstanding student loans is having a paralyzing impact upon the financial stability of graduates. Helping your child, niece, nephew or grandchild with an education savings plan may be one of the greatest gifts you can give to another. 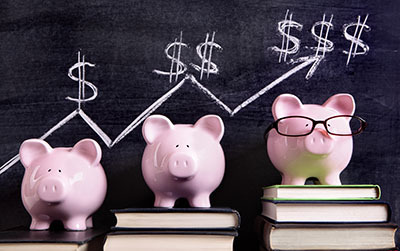 In addition to the popular Section 529 College Savings Plan, there are also many other ways to save for a college fund. Some of the education savings plans allow money to grow federally tax deferred and the proceeds can be withdrawn tax free for “qualified” education expenses. R. J. will review each client’s situation and find the best option that suits them and the child who will receive the education savings plan. Please contact us to discuss education savings options. Our comprehensive investment planning and review process first helps you to determine what your risk tolerance profile is and then we match you with an appropriate investment portfolio. We help you to choose inversely correlated investment classes so that your investments continue to increase in value over time, despite downturns in certain market sectors. We also have the ability to provide you with access to institutional investments… lower cost investments that are actively managed and provide a wide range of portfolio options. Please contact us to make an appointment with that R. J. to discuss your investment planning options. Capital gains taxes are … wait for it … voluntary. Federal estate taxes are … voluntary. Generation skipping, gift tax, and so forth are … voluntary. You don’t have to pay them as long as you support the social well-being of the country in a way that is, as said, in alignment with what is important to you … which could be your own family foundation.Are you taking advantage of the opportunities to opt out of the “involuntary philanthropy”? You can direct the money you would have paid in these taxes towards “voluntary philanthropy”… supporting those organizations, causes and missions that you feel can make the best impact on the lives of other Americans. “Zero tax planning” approach is simply utilizing the rules that are already in the tax law, but which only a fraction of advisors discuss with their clients, and even fewer clients are aware that these opportunities exist.